So randomly one Wednesday in February last year I got a day to just wander the city and enjoy the delights of Melbourne. 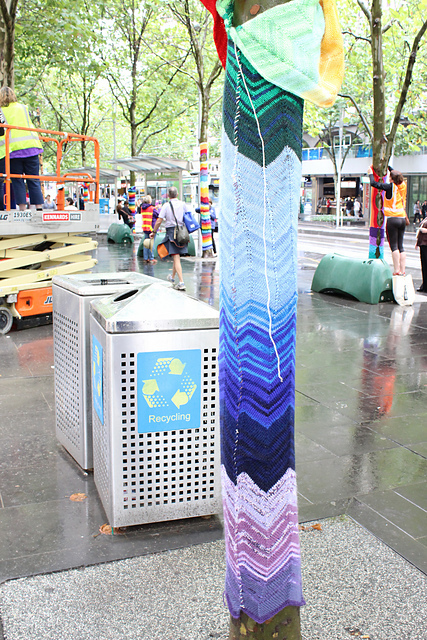 I love Melbourne. 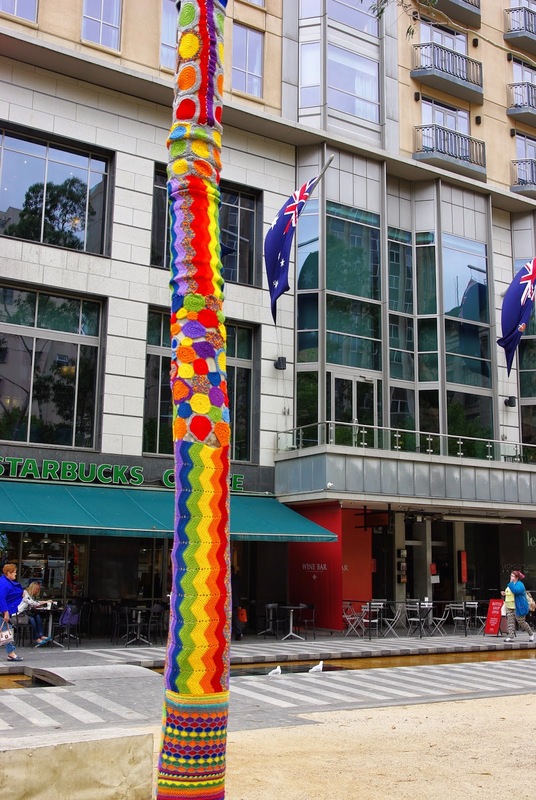 It has a beautiful European vibe, quirky laneways with amazing graffiti and a food and coffee culture the envy of the rest of Australia. 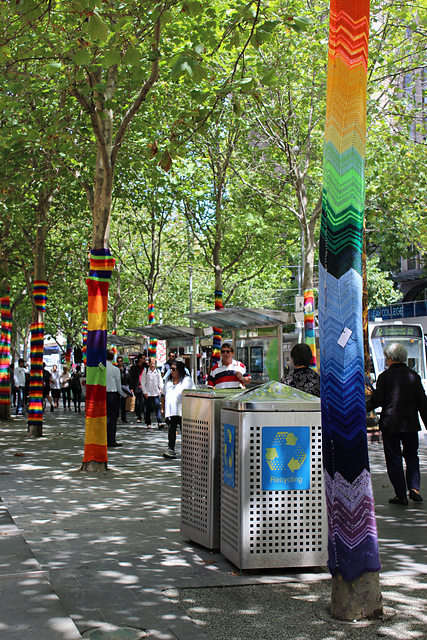 I wondered passed the City Square and was transfixed with the yarn covered trees. 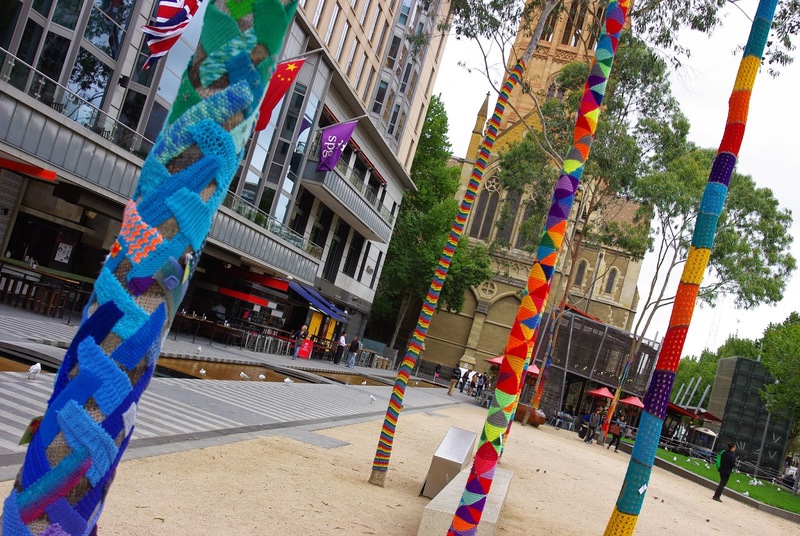 Bright and colourful rainbow yarn bombed trees. I may have hugged a few and definitely patted the knitted one admiringly. I couldn't help but smile. This is my favourite. 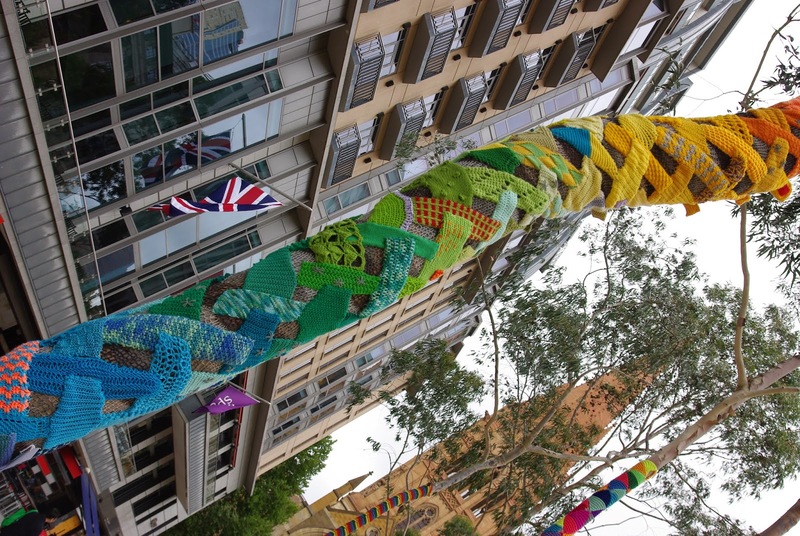 Perhaps it's because it's knitted or maybe it's the cleverness of the arrangement of the strips around the tree. 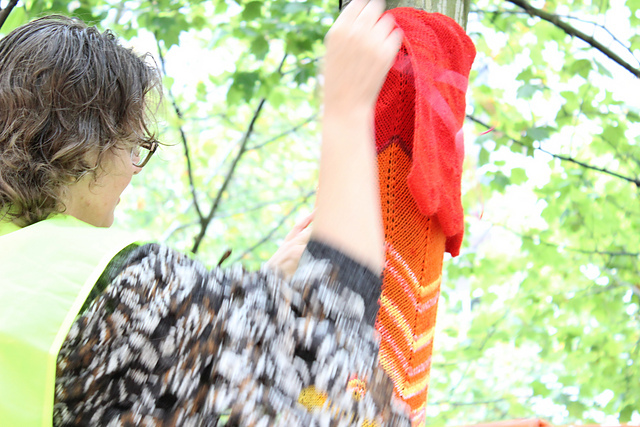 Whilst I was communing with the trees I discovered the Yarn Corner business card tied to each tree. I snaffled one, took it home and looked them up. 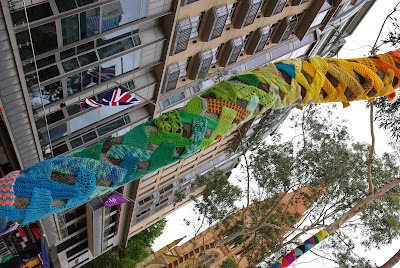 Next thing I know, I'm a signed up member thinking I have the skills to do this and with a burning ambition to tackle a City Square tree next year. As soon as the sign-ups were open I put my hand up for a tree. 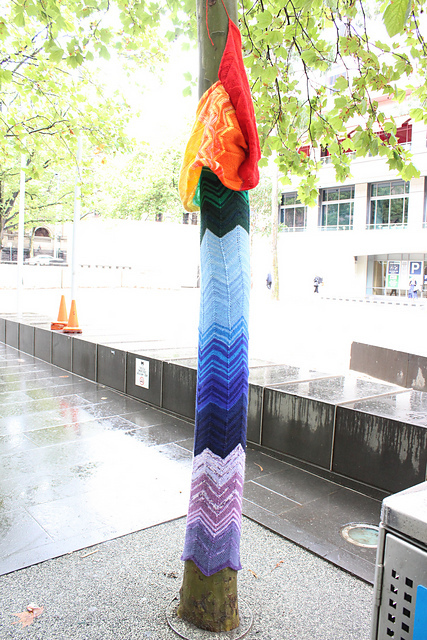 I spent the next few months knitting sporadically on a nearly three metre long tree blankie. 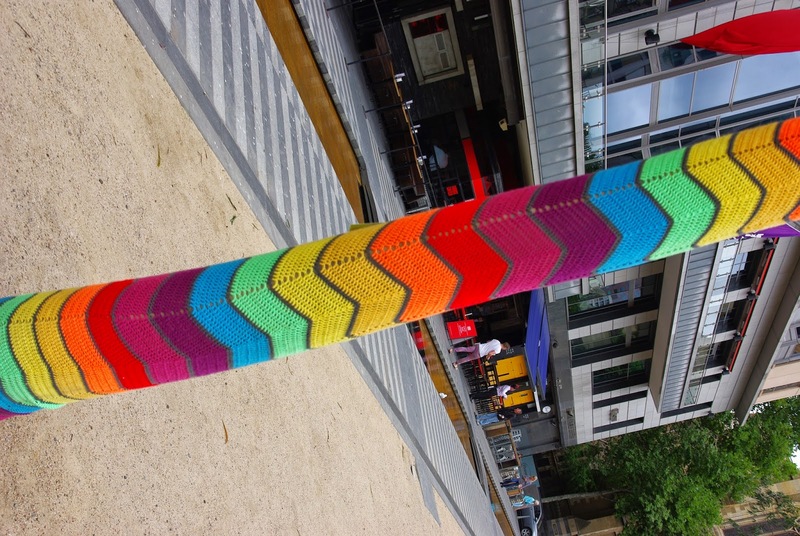 The rules were rainbow stripes using only the traditional rainbow colours. So I decided knitted chevrons were the go and hunted for free knitted chevron blanket patterns on Ravelry. The kids argued for a single rainbow from the bottom of the tree in purple to red at the top. 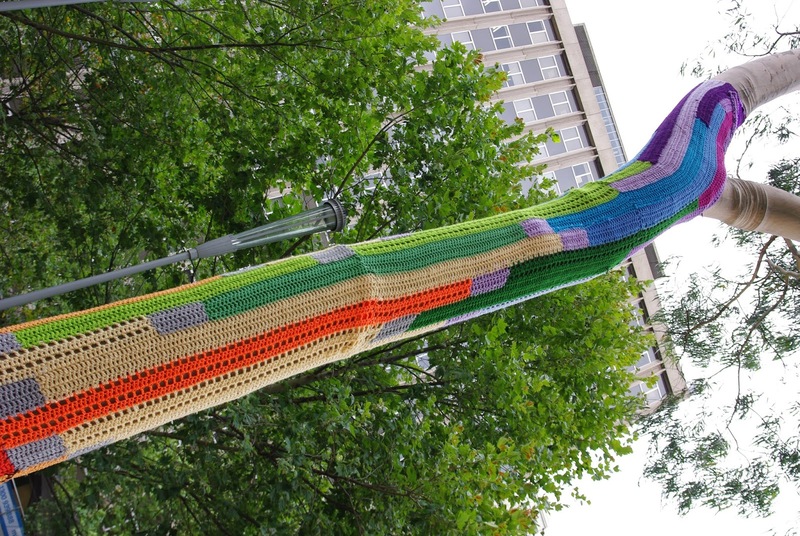 (This turned out to be a really inspired choice on their behalf as it made for a unique and eye catching tree). Install day arrived and the boy and I caught the red eye train (which turned out to actually be a bus) to the big city. 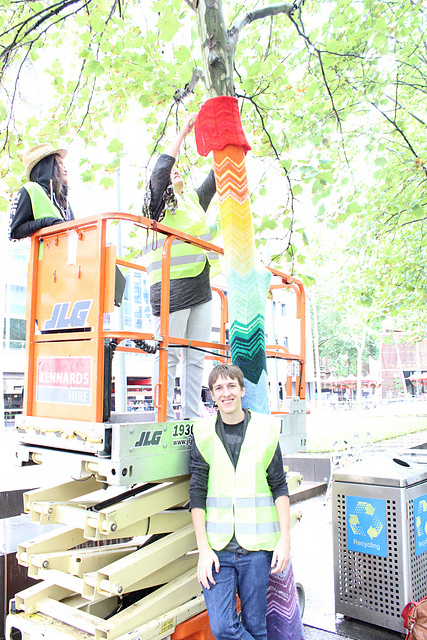 We were all prepared with yarn, sewing needles, scissors, mega safely pins, our hi-vis vests and of course a giant knitted rainbow in a bag as well as a camera ready to document the behind the scenes magic of the installation process. And then it rained. In fact it sort of slightly poured. (The weather totally disrespected the fact that it was sill late in January and high Summer). It threw a giant spanner in the works. 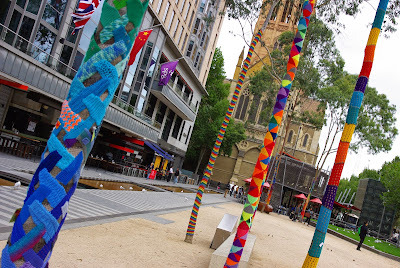 The central area of the City Square is sand covered and the scissor lifts needed to install the yarn bombs on the upper sections of the trees couldn't get near the trees as they would have got bogged in the mush. It was still possible to do the trees along the edge of the footpaths. So we dodged the showers - mostly. 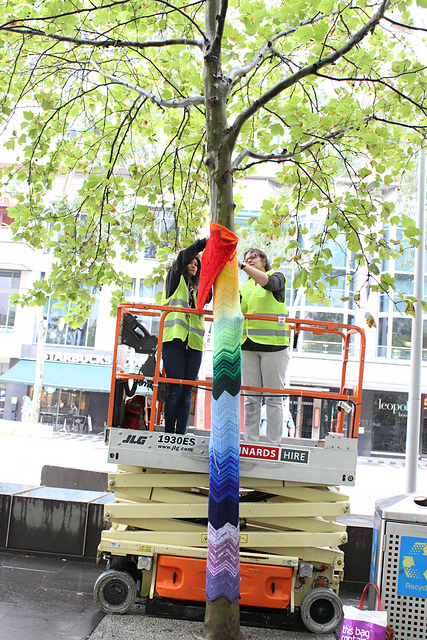 With advice from the veteran and experienced yarn bombers we pinned our piece to its tree. 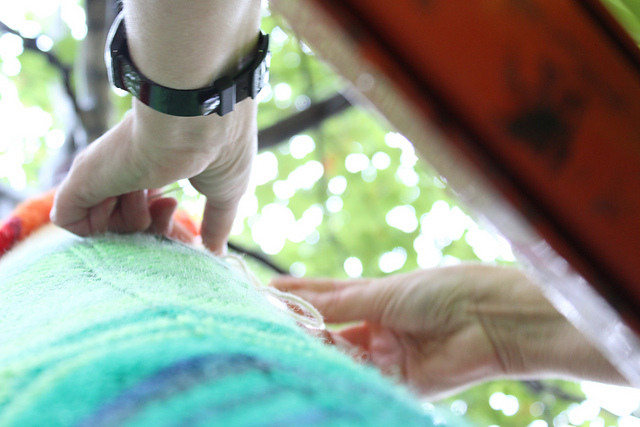 The boy demonstrated that he too could sew and we stitched up as far as we could reach from the ground. I got to go up in a scissor lift and attach the top section. Despite me worrying that the piece I'd made was going to be too long, it was exactly perfect anchoring nicely around a branch at the top. The boy got sort of adopted and is now a signed up member of Yarn Corner ready to contribute his skills in sewing, basic knitting and photography. 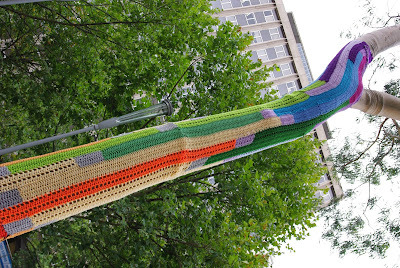 I met a lovely bunch of people all of whom have a passion for knitting, crochet and community. I got to watch random strangers smile and pat my tree. One small child even hugged it. 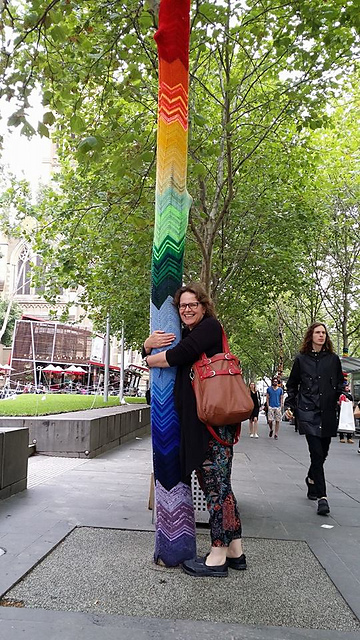 I followed the adventures of my tree in downtown Melbourne for the next few months on social media particularly instagram until I reluctantly helped it disrobe in the middle of March. I may have even hugged my tree myself.